Genesis heat-set Artist Oils on 13cm x 18cm gessoed mdf panel. My faithful rose bush produced another flower so I set up a simple still life in my lightbox and set to work. Had loads of fun. These roses have a divine scent, I love them. Posted on June 26, 2017 by Jaana Day. 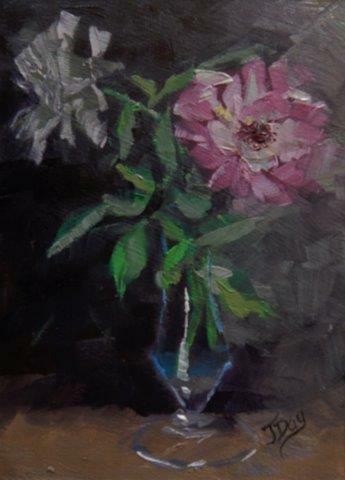 This entry was posted in Flowers and tagged brown, brush strokes, floral, flowers, Genesis Heat Set Oils, green, impressionism, impressionist, Oils, Painting, pink, Rose, roses, white. Bookmark the permalink.